Is there a chef inside of you? 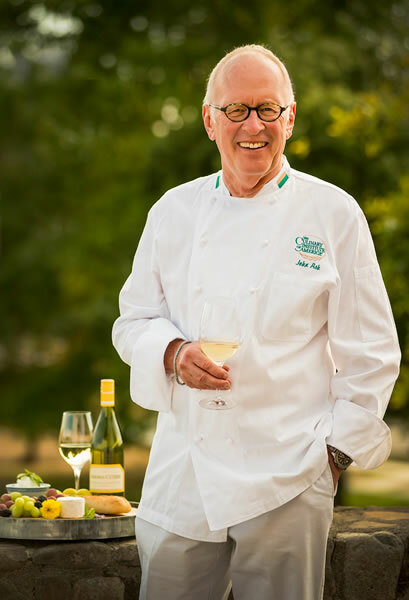 Meet Chef John Ash, the “Father of Wine Country Cuisine” and make use of his tips on sustainable cooking and dining. Chef John Ash is a two-time James Beard award-winning author, teacher, and restaurateur. He co-hosts a weekly food and wine radio talk show, The Good Food Hour, broadcast in Sonoma County, and teaches cooking classes at various cooking schools, including the Culinary Institute of America in St. Helena, California. His cookbook, Culinary Birds, won a James Beard Award for Best Single Subject Cookbook. He lives in Santa Rosa, California. Plan a stay at one of the best bed and breakfasts in Sonoma County and attend a Chef John Ash class or event. See event calendar here. Here is an exciting article in the Press Democrat about my new book, “Cooking Wild” by Diane Peterson. The article includes a recipe and starts here … “John Ash of Santa Rosa, known as the “Father of Wine Country Cuisine” and one of the region’s most renowned chefs, has always been a visionary, capturing the zeitgeist of his time while gazing presciently into the future. “When he first opened his namesake restaurant, John Ash & Company, in Montgomery Village in 1980, it was one of the first in Northern California to focus on local, seasonal ingredients and to create dishes that complemented the wines being made in the region. Now, more than 35 years later, nearly all restaurant chefs worth their salt aspire to meet that high standard. “As an international cooking teacher, Ash also educated a new generation of home cooks eager to eat more simply and more ethically, closer to the fresh flavors of the gardens and farms in their own back yards.